Given the conceptual framework described above, the next thing is to look at how that framework is implemented within both WP and BP. Figure 2, below, provides another information model. This time we are looking at a model of the database tables used by WP and BP to maintain User and User Profile information. This is where the rubber meets the road. A unique ID number that serves as the key for the attribute within the table. The user ID of the user that the attribute is associated with. A name for the attribute (e.g., first_name, last_name, nickname, description, etc.). A value field defining the content or ‘value’ for the attribute (e.g., ‘Joe’). Figure 3, below, shows how attribute assignment is accomplished using WP function calls. The get_users() function can be used to obtain an array of user objects. By default each user object in this array is populated with the information from the users table. If desired, additional fields from the usermeta table can be requested at this step or usermeta data values (or other variables) can be used to restrict which users are returned (e.g., return all users named ‘Joe’). The user ID value returned for a user can also be used as a parameter value to the get_user_metavalues() function to return an array of usermeta data. Obtaining a desired set of attributes using the get_users() function eliminates needing to deal with the complexities shown in the bottom of the diagram. The options table is a utility workhorse within the system. In effect it is a keyed storage system to store away and retrieve all kinds of miscellaneous data. Blocks of information are given an identity by use of a key name and then stored and retrieved using that key. One of these blocks is keyed with the ‘user_roles‘ tag name. That information block defines all Roles identified in the system and it identifies all Capabilities assigned to each Role. 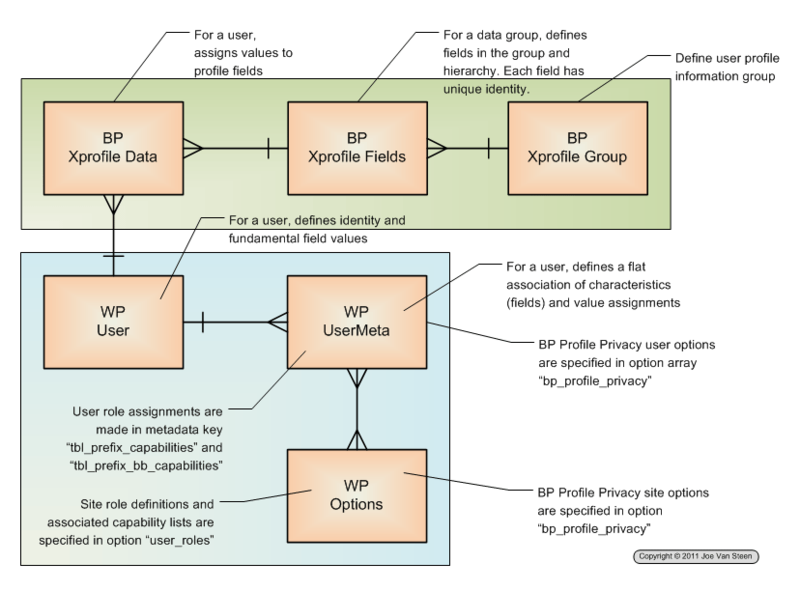 The bp_xprofile_groups table is very straight forward. Each data field in a user’s profile is assigned to a group. This table defines those groups and gives them labels for display purposes. This data grouping ability is not provided by the WP user profile facilities. Further characteristics define choice values for selection fields, choice ordering and default choices. A value assignment for field for that user. A timestamp for the date and time the value assignment was last changed.